Westminster as viewed to the northeast from the top of a Golden Pier building. 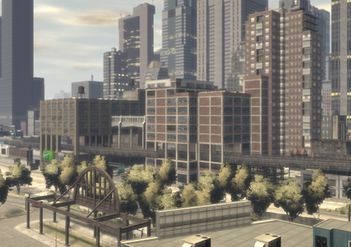 Westminster is a neighborhood in western Algonquin, Liberty City in Grand Theft Auto IV. It is bordered to the north by Lorimar Street (Purgatory); to the east by Frankfort Avenue (Star Junction); to the south by an access road to Union Drive West and a multi-story car park (The Meat Quarter); and to the west by the West River. Much like its neighbor The Meat Quarter, Westminster is primarily depicted as a mixed-use district, where residential and commercial buildings are concentrated towards Frankfort Avenue to the east. Parking complexes and industrial buildings can be found on Union Drive West and the West River harbor, which also houses piers. However, the waterfront of Westminster has apparently underwent urban renewal. The piers, along with the waterfront marina in The Meat Quarter, are collectively referred to as Golden Pier. Also located in the western portion of the neighborhood is a large parking complex which stretches north into Purgatory. Like The Meat Quarter, a stretch of abandoned elevated railway runs over the district, and cuts off in the north, just over the Pay n' Spray in Purgatory. Westminster is also similar to The Meat Quarter in that its harbor front has been redeveloped to some degree. There are quite a few points of interest in the neighborhood. At the aforementioned Golden Pier is Pier 69, in which an establishment known as "Hoop City" is located (however, it is currently closed for refurbishment). The Hercules club is also revealed in The Ballad of Gay Tony to be situated at the northern edge of the district, at Galveston Avenue, just beside the Algonquin end of the Booth Tunnel. Westminster is a center of emergency response services for Algonquin. There is an LCPD station on Kunzite Street between Frankfort and Galveston Avenues, where Deputy Police Commissioner Francis McReary's office is situated. Engine 47, a fire station, is located on Frankfort Avenue between Jade and Kunzite Streets, around the corner from the police station. There are no Fire Trucks park in the location. Finally, a 60 Diner is located at the intersection of Frankfort Avenue and Kunzite Street. Westminster's name may be based on that of Chelsea and Greenwich Village on the West Side of Manhattan. All three locations they are based on are districts in London (Westminster, Chelsea and Greenwich), and both GTA IV's Westminster and the West Side's Chelsea and Greenwich Village are bound by roughly the same geographical features and streets. The general design of the district is alike that of The Meat Quarter, with the areas closer to the coast bearing similarities to Gansevoort Market, also known as the Meatpacking District, in Manhattan, while the areas bordering Frankfort Avenue are more generic, heavily developed commercial and residential areas, similar to Chelsea. Golden Pier and the coastal design of Westminster (as well as The Meat Quarter) are also based on the Chelsea Piers. Lincoln Tunnel on the Manhattan side, in the form of the Algonquin half of the Booth Tunnel. The Booth Tunnel's ventilation tower, however, is dissimilar to that of the Lincoln Tunnel, being more alike the Holland Tunnel's design, but still not an accurate reproduction. Remnants of Pier 54 in Chelsea Piers, where it is represented in Algonquin, affront Pier 69, as a similarly designed skeletal remains of a pier's entrance. Westminster is the terminating point of the Booth Tunnel in Algonquin, linking Frankfort Avenue to Asahara Road in Alderney. In addition, Westminster is designed to contain the entire Algonquin half of the Booth Tunnel, as well as the tunnel's ventilation tower in the north, offshore. Westminster is served by only one subway station: Frankfort Avenue station on the K/C Algonquin Inner Line, located at the intersection of Lorimar Street and Frankfort Avenue in the northwestern corner of the neighborhood, at its border with Purgatory and Star Junction. An interesting sight can be witnessed over the access road to the Booth Tunnel: due to the topography of the land (the further inland you go, the higher the elevation), a short segment of the Algonquin Outer Line, which is in a subway, actually passes over the sloping, surface-level access road. As mentioned, Westminster also contains the northern half of an a disused elevated railway line, evidently based on the High Line. This page was last modified on 23 August 2012, at 22:21.